Samsung today announced some new stylish and colorful Protective Flip Covers for the Galaxy S III and Galaxy Note II. If you’ve watched any television over the last few months then you’ve probably seen one of these in the Samsung commercials. Designed to protect both the face and the backside of your beloved Android, these snap on the back in place of the battery cover. The covers are great and provide a way to change up the color and look of your phone but, beware, they do not come without a price. You can grab them for $39.99 a piece or in the new $49.99 two-pack. Want to go all out? Consider the $99.99 four-pack, a fairly reasonable bundle. Head to samsung.com to learn more or to order a case for yourself. DALLAS — November 29, 2012 — Samsung Telecommunications America, LLC (Samsung Mobile) – the No.1 mobile phone provider in the United States1 – is giving U.S. Galaxy Note II and Galaxy S III users the ability to customize Samsung’s newest iconic smartphones with its Protective Flip Cover, a unique case solution available in an array of vibrant colors. In addition, Samsung Galaxy Note II and Galaxy S III owners will be able to purchase bundles of Protective Flip Covers in multiple colors at a discounted price. Samsung’s unique Flip Cover design was introduced alongside the original Galaxy Note® and again with the Samsung Galaxy S III. 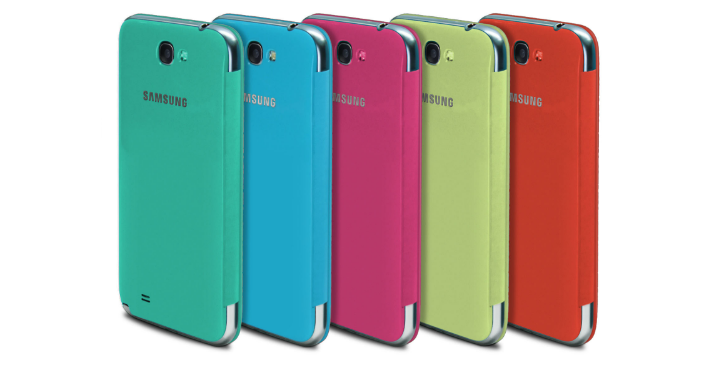 Now, just in time for holiday shopping, the launch of the Galaxy Note II on five major carriers brings this premium accessory to users in seven stylish color options – Titanium Gray, Marble White, Light Blue, Pink, Mint, Lime Green, and Orange. With the option to purchase a bundle of Flip Covers in a variety pack of colors, Galaxy Note II customers can change Flip Covers to match any occasion or outfit, just like jewelry, hats, and other fashion accessories. The Samsung Protective Flip Cover is a one-piece folding design with a stylish front cover and glossy snap-on back. While the front flap of the Flip Cover shields the 5.5-inch HD Super AMOLED™ touchscreen display of the Galaxy Note II from pesky fingerprints, scratches, and dirt, the back of the accessory snaps on to replace the phone’s back battery cover. This distinctive design provides additional protection to the screen while retaining the slim profile of the Galaxy Note II. The Protective Flip Cover also enhances the overall look and feel of the Galaxy Note II with a design that perfectly complements the smartphone’s narrow form factor. In addition to protecting the screen when closed, there is no need to remove the Protective Flip Cover to access the phone’s side buttons or jacks, since the cover was designed never to interfere with normal phone functions. With the Flip Cover attached to the Galaxy Note II, all ports, buttons, and microphones are easily accessible, allowing the user to make phone calls and use the speaker phone even when the Flip Cover is closed. Additionally, the fold over design of the Flip Cover offers privacy for users wanting to text or email discretely without the risk of wandering eyes nearby, while also improving screen viewing quality in bright sunlight by conveniently offering shade at a variety of angles. The Galaxy Note II Protective Flip Cover is available for $39.99 each at Samsung.com, and is also available in multicolored bundle options of four covers for $99.99, or two covers for $49.99 on Samsung.com. Galaxy S III Protective Flip Covers are currently sold separately for $39.99 and will also be available in multicolored bundle options for $99.99 (four colors) and $49.99 (two colors) 2.